El Paso, Texas Tyler James Sumlin (former Army EOD) and Jason Wayne Jarvis (active duty EOD) were arrested on allegations that they conspired to assemble a cache of weapons and explosives that were to be illegally sold and smuggled into Mexico. According to the criminal compliant, the two allegedly met with undercover agents from Homeland Security at a truck stop where they agreed to sell weapons and explosives for $75,000 with the exchange to occur at a nearby storage warehouse. However, when the group arrived at the warehouse, the undercover agents arrested to the two men. According to court documents, agents seized 32 rifles, three handguns, and five pounds of C4 explosives. They also seized silencers, a short barreled rifle, and a hand grenade, according to the indictment. Tyndall Air Force, Florida If you leave near Tyndall Air Force Base, don't be surprised if you hear some loud booms from now until March 8. Tyndall's EOD Unit is disposing of live ordnance damaged by Hurricane Michael. It's happening on Tyndall's EOD range, but officials say you may still hear sounds of explosions near the base. Tyndall leaders are working with the Florida Department of Environmental Protection to destroy the hurricane damaged munitions. Any "blast waves" felt or heard are extremely low-pressure and will not harm people or buildings. Randolph Air Force Base, Texas The Air Force Personnel Center announced a selective retention bonus program of up to $75,000 for Sr. level NCO EOD Airman. The offer applies to Master Sergeants and Sr. Master Sergeants but not Chief Master Sergeants with at least 20 years, but fewer than 25 years, of active duty service. According to the announcement, eligible EOD specialists who sign up for three more years would receive $30,000, a four-year service agreement would draw $50,000, and airmen who sign up for five more years would receive $75,000. The bonuses could be payable in either a lump sum, or in periodic installments. Fort Hood, Texas Army officials reported that EOD Specialist Spc. James Thomas Smith IV, 23, assigned to the 752nd Ordnance Company, 79th Ordnance Battalion was killed in a motorcycle accident. Circumstances surrounding the incident are currently under investigation by the Temple Police Department. Smith's military awards and decorations include the Nation Defense Service Medal and Army Service Ribbon. 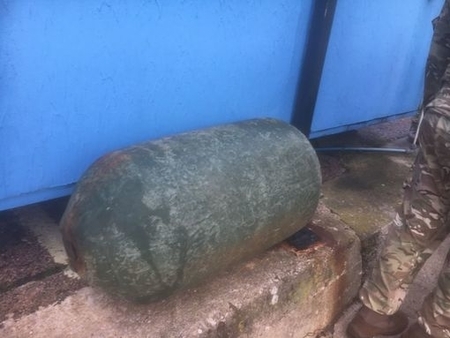 Topeka, Kansas Army EOD from Ft. Riley responded to dispose of an ordnance found buried underground near a police impound lot in Topeka. The UXO, initially uncovered by utility workers, was safety removed and disposed of by the EOD unit. The exact type of round was not reported. Eglin Air Force Base, Florida The Naval School Explosive Ordnance Disposal (NAVSCOLEOD) hosted the 48th Annual EOD Memorial Ceremony at the EOD Memorial on Eglin Air Force Base on May 6. The EOD community from each of the joint Services gathered to honor the memory of 320 EOD heroes and add six additional EOD Technicians to the EOD Memorial. Those added to the memorial this year include: Army Sgt. 1st Class Biddle Carrol Izard, Jr. killed in action on June 19, 1968 while serving in Vietnam; Army Tech. Sgt James H. Eberle, killed in action on Aug. 23, 1944 while serving in WWII; Navy Senior Chief EOD Technician Scott Cooper Dayton killed in action Nov 24, 2016 while serving in support of Combined Joint Task Force, Operation Inherent Resolve; Navy Chief EOD Technician Jason Christopher Finan killed in action Oct 20, 2016 while serving in support of Combined Joint Task Force, Operation Inherent Resolve; Navy Ensign Charles Williams Grice, Sr. killed in action May 14, 1945 while serving in WWII; Navy Gunner's Mate Seaman Robert Paul Burr was killed in action July 16, 1944 while serving in WWII. UXOInfo.com salutes these brave men and their families. Guam Navy EOD responded to what was believed to be an unexploded World War II ordnance at the Inarajan Pools. However, according to reports, the UXO was actually just a parking barrier covered in cement.